Koh Rong Sanloem is bigger than it looks! 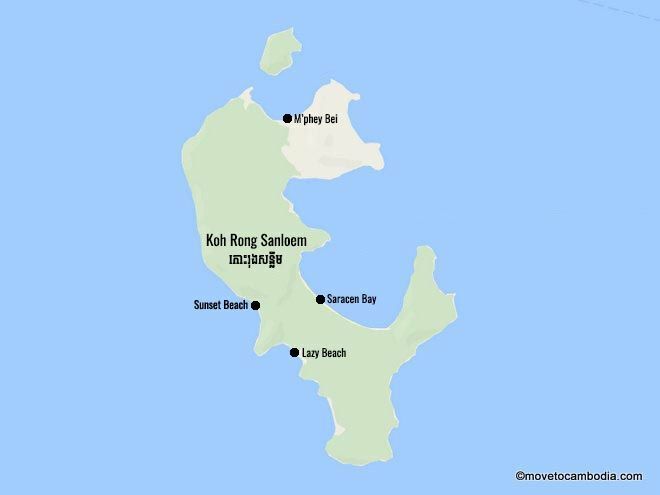 Koh Rong Sanloem is quite large, with 37 kilometers (23 miles) of coastline. The four main areas with accommodation are far apart, so it can be difficult and expensive to get from one to the other. 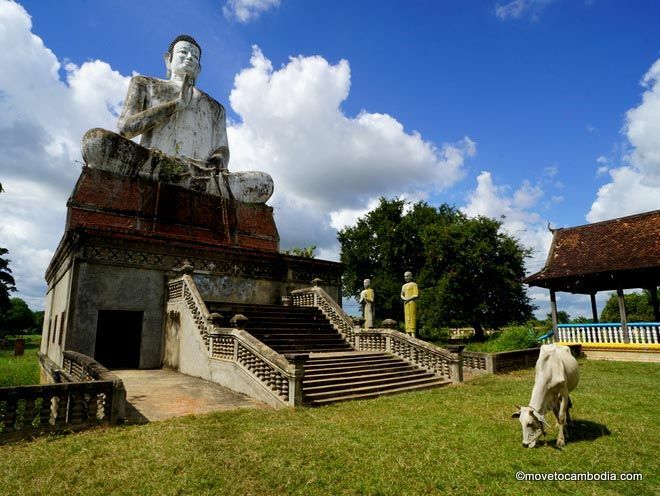 For this reason, visitors should make sure they know which part of the island they are headed to when they leave Sihanoukville, and know that once they arrive they will be pretty much confined to the beach they have chosen — not a bad place to be stuck, though! Travel around the island is possible by longtail boat, but it can be surprisingly pricey and time-consuming, and the sunset side of the island often has high waves that can make transport in these rickety boats hair-raising, to say the least. 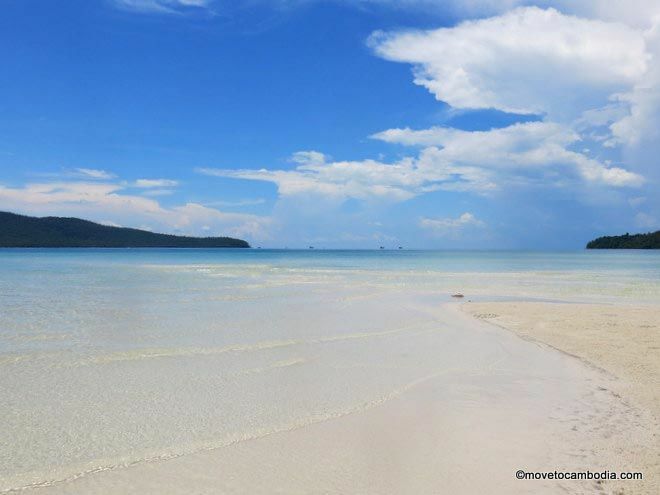 Beautiful Saracen Bay is where you’ll find Koh Rong Sanloem’s most high-end accommodation. Saracen Bay has only begun to be developed in the last few years, but is already earning a reputation for having some of the nicest accommodation on any of the islands in Cambodia. While there are a few dorms and budget options on Saracen Bay, for the most part you can expect to pay $40+ per night, and at many places at least double that. Luckily there’s a lot to choose from, with more than a dozen different places to stay and more on the way. Known for its beauty and tranquility, Saracen Bay is a great place to get away from it all. It’s graced with white sand beaches and placid turquoise water, which is usually quite shallow close to shore.On this side of the island it’s worth waking up early — at dawn you’ll be treated to a gorgeous beachside sunrise. M’phey Bei is a fishing village turned backpacker paradise. 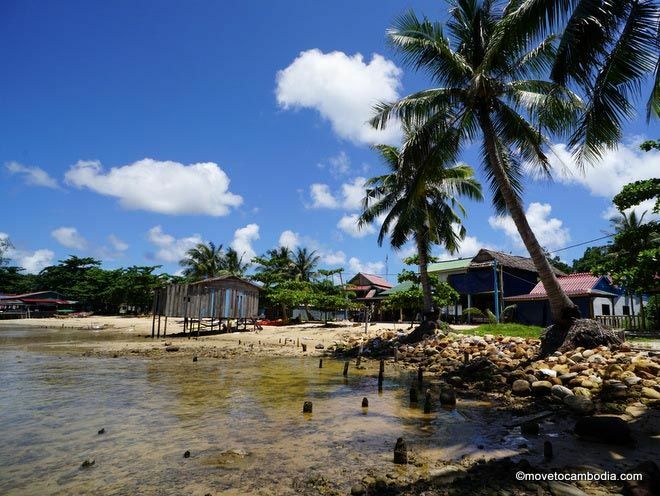 Koh Rong Sanloem’s only real village, M’phey Bei (the number 23 in Khmer) has become a popular tourist spot where backpackers amiably coexist with the fishermen and their families who have made their home there for generations. M’phey Bei offers the most budget-friendly accommodation on the island, with dorm beds going for as little as $5 in low season and rooms and bungalows for less than $20 a night. No wonder so many people come for a day or two and end up staying for a month! Because it’s a fishing village, the beach in front of M’phey Bei is mostly used as a pier and for docking fishing boats. 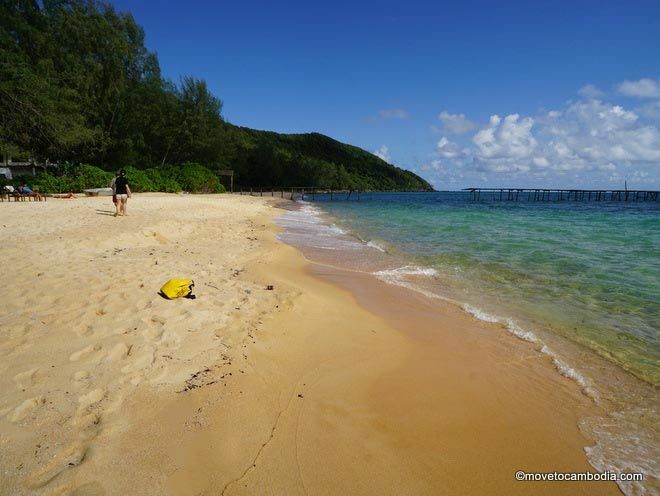 But just a short walk away is a lovely deserted beach with excellent snorkeling opportunities. M’phey Bei has the laid-back vibe that Koh Rong possessed before it was taken over by daytrippers and party monsters. For now this little village is wonderfully undeveloped, but it’s certain not to stay this way for long. On the western side of the island, Sunset Beach offers a peaceful island experience. Koh Rong Sanloem’s Sunset Beach is so called because of the gorgeous pink and purple sunsets that visitors are treated to every night. The long stretch of yellow sand beach is home to just a handful of guesthouses, giving the place am easy-going, secluded feel. It’s hard to pin down Sunset Beach’s vibe, probably because it’s slowly in the process of changing as, one by one, new places are being built. 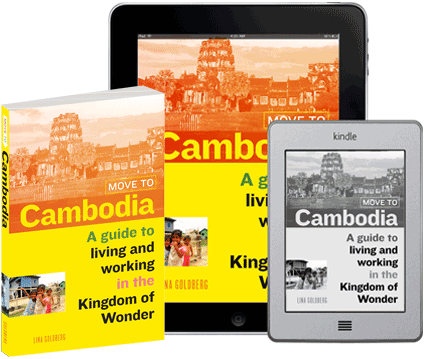 For the most part, the bungalows are European-owned or -managed, and the area is popular with French visitors to Cambodia. Sunset Beach is truly isolated, but the few guesthouses there each have a bar and restaurant, so there are a handful of options for eating and drinking. All of the accommodation owners have made an effort to provide a range of activities, so even though there’s not much there, there’s a surprising number of things to do, from paddleboarding and playing pool or petanque to volleyball tournaments and beachside BBQs. Lazy Beach welcomes families and travelers who want nothing more than to laze about. Lazy Beach is a private beach for one of the oldest accommodations on the island, the resort of the same name. The yellow sands of Lazy Beach, set about with tropical pines, make for the perfect quiet getaway, and the resort welcomes children and families. The beach itself is more that 700 meters long (2,300 feet), which is more than enough, because the only people you’ll be sharing it with are other guests of the resort. 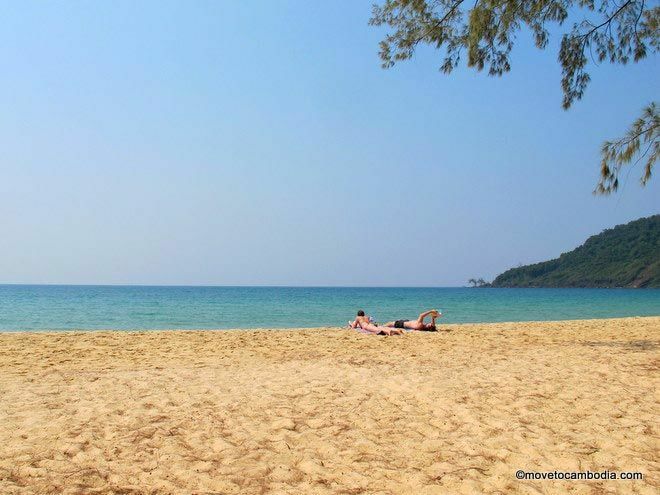 Lazy Beach is the most secluded beach on Koh Rong Sanloem, but the English owners and their Khmer family have made sure to provide everything that’s necessary and offer lots of activities. Lazy Beach is particularly nice because the resort staff clean the beach every day. Many of the other beaches on Cambodia’s islands are blighted with plastic bags, bottles, and rubbish from fishing boats that washes up on the shore. Not so Lazy Beach, where all you’ll find on the sands are pine needles from the trees that fringe the beach.